Now featuring the latest version of Cubelock and in-depth strategy advice. Our Cubelock deck list guide features the best Rastakhan deck list for Season 60 of Hearthstone (March 2019). Our Cubelock guide also contains Mulligan advice, card combos and strategy tips. Cubelock is a Hearthstone deck that arrived with the Kobolds and Catacombs expansion at the end of 2017 and has remained entirely unchanged with the launch of Rastakhan’s Rumble. With this fearsome deck your task is to leverage the mighty combo power of cards like Carnivorous Cube and Spiritsinger Umbra to create an extraordinarily powerful fighting force of eternally resurrecting minions. You'll most often achieve this by targeting your Doomguards, but if that sounds like Discard-hell there are ways to key pieces of your puzzle vanishing into the ether: Possessed Lackey recruits a Demon directly onto the board with zero penalty, for example, while Skull of the Man'ari similarly plays a Demon from your hand automatically at the start of each turn. In our guide to playing this archetype, we've outlined the strongest deck list seeing competitive play right now, and also provided some Mulligan advice for starting out each match. After that we've gone through the top-line strategy behind playing Cubelock, but we think you'll gain most insight from looking through the combo section at the bottom of the page. There are no major changes for Cubelock as we enter the final week or two of Rastakhan's Rumble. Chances are we'll be parking this one now, as so many key cards are to be rotated out with the launch of Rise of Shadows. Was it good while it lasted? The strategy with Cubelock remains the same as it has always been: answer your opponent’s early game aggression, and then barrage them with multiple copies of your late game demons thanks to the powerful Deathrattle effect from Carnivorous Cube. Bloodreaver Gul’dan is there to see out the victory. Early game: Spend the early game responding to your opponent’s threats and slowly working towards your own late game with card draw. Kobold Librarian, Defile and Doomsayer are excellent options to help you clear off early game creatures. Don’t be afraid to Life Tap aggressively for the first couple of turns if you have the Mana to spare, need to dig for your important cards or are holding onto a Mountain Giant. You have a lot of life gain in the deck through Dark Pact and Lesser Amethyst Spellstone to restore any lost health. Mid game: This will likely be the turning point against aggro and mid-range decks. If their board is looking threatening, then now is the time to go for clears using Hellfire and Defile. Taking out a lot of their minions with those cards is key to starving them of resources so you can take control heading into the late game. If you can get your legendary weapon Skull of the Man’ari in play on Turn 5 as well, Doomguard and Voidlord will be significant obstacles for your opponent that early on. Possessed Lackey with Dark Pact is a terrific combo to heal you up while also bringing a big demon onto the board. Late game: Now you can start having fun. 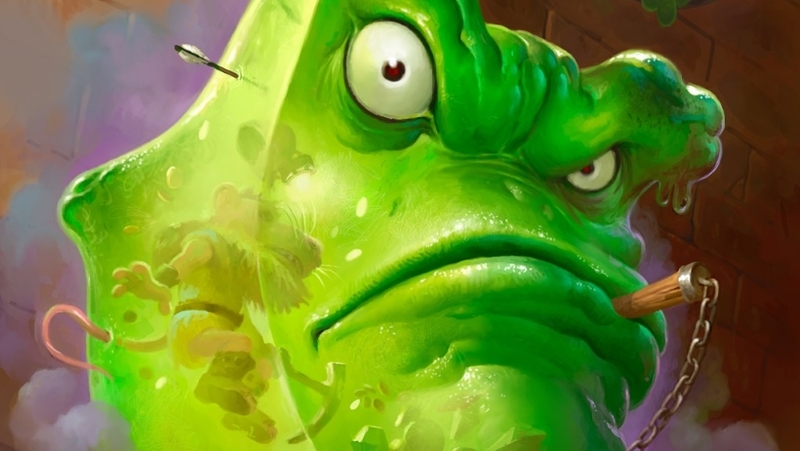 With Carnivorous Cube you’ll either want to set up a near impenetrable wall of minions by having the grumpy green fella chomp away on a Voidlord, or if you see the chance to rush your adversary down then a Doomguard might be the more sensible choice. Even if they somehow manage to see off all of these threats you have Bloodreaver Gul’dan to bring them all back again. 1. Keep aggressive openings in check with your efficient early game cards such as Kobold Librarian, Defile and Doomsayer. 2. At the same time, be careful not to be drawn into using significant board clears too early on, and save them for when your opponent has over-committed. 3. Don’t be afraid to let a fair bit of chip damage through early in the game, as you can restore much of your lost health through the multiple healing effects in the deck. 4. Get practising your maths with Defile. Lots of minions in aggro decks have relatively low health, so if you set the board properly you can wipe out everything with just a single card. 1. They’ll be slow to get started so be comfortable taking your time too. Life Tap to draw more cards, build up to a cheap Mountain Giant, and even consider passing if it looks like the best play – there’s no reason to rush. 2. Control matches often come down to the first player who blinks. Go for a strong Carnivorous Cube turn if the time looks right, but also consider holding off if your opponent might go for a big play next turn that you can stifle first. 3. Extract every last drop of value from your late game minions and Carnivorous Cube. The more you can duplicate, the greater the chance you’ll have of outlasting your opponent. 4. Be mindful of how many times you could summon a Voidwalker using Bloodreaver Gul’dan. The taunts can be useful, but they’re far less valuable that a proper Voidlord or Doomguard. 5. That said, Bloodreaver Gul’dan can also be instrumental in keeping you alive in the late game thanks to its three damage-plus-Lifesteal Hero Power, so consider playing it earlier if you’re in a tough spot. 1. Kobold Librarian: A one Mana 2/1 minion that also draws you a card? Always keep this. 2. Skull of the Man'ari: Expensive at five Mana to keep in the opening hand, but can pull powerful cards such as Voidlord four turns early. 3. Doomsayer: A cheap way of stalling for more time, and handing you the advantage of a clear board - assuming it survives to dish out its special effect. 4. Mountain Giant: Spend the first few turns life-tapping and you can play this massive 8/8 monster on Turn 4. Here's a breakdown of all the combos contained in this exact version of Cubelock. As the deck list itself changes, we'll update the rest of this guide to take those tweaks into account. - Here's how that Defile mechanic actually works. When you play this spell, a single point of damage will be dealt to all minions. If any of those minions die, the spell is cast again. The spell will continue being triggered until no minions die as a result of a cast. - Lesser Amethyst Spellstone is the Warlock's signature Spellstone card. In its vanilla state it's just a four-Mana spell that damages a minion for three and heals your hero for the same amount. Take damage from another card while this is in your hand though and it'll grow to five damage/heal. Take damage again and the Spellstone maxes out at seven damage/heal. - Spiritsinger Umbra will immediately trigger the Deathrattle effects of any minion you play as long as this character stays alive on the board. - Possessed Lackey will grab a minion that's remaining in your deck pile and put it directly into play. Note that this is not a copy of that minion, and so you should try to track what's been recruited as you start thinning down your deck. - Always remember that Hellfire not only dishes out damage to both friendly and enemy minions, it also damages both heroes too. Something to think about when you're running a little too close to zero for comfort. Think about the burst damage your opponent might have access to immediately afterwards as well. - If Skull of the Man'ari is equipped, a Demon in your hand will be chosen at random and put onto the board at the start of your turn. You only have two options for that process in this deck: Voidlord and Doomguard. Note that if Doomguard is summoned in this way then you will not throw any cards away - the negative Battlecry just won't go off. - Let's talk about the big combo in this deck. Once a Demon is out on the board - and once it's been utilised, of course - you can destroy it with Carnivorous Cube. When the Cube dies, two copies of the targeted Demon will be summoned back onto the board. Note that Dark Pact can be used to spawn those extra minions immediately - handy if you suspect a silencing effect might be on its way. - The Mountain Giant cards you draw into will cost one Mana less for each other card in your hand. It's possible to create a massive board presence using these cards with Faceless Manipulator in particular. - Prince Taldaram can be useful in creating even more Carnivorous Cube mayhem! - If you manage to land your Faceless Manipulator onto a Carnivorous Cube you’ll be able to spawn so many additional minions. It also works well on Doomguard for a chunk of burst damage. - Lord Godfrey is basically your Defile on steroids. This guy keeps casting two points of damage until no minions die. Even better, he survives on the board afterwards as a 4 / 4 minion. - Bloodreaver Gul'dan is yet another source of late-game power. When he's played he'll resummon all of your Demons back onto the board. Whether those are Voidlord Taunts or Doomsayers, your opponent is going to have a really bad time of things. Don't forget either that the new Hero Power allows you to chomp three damage into a minion and return that damage to your hero as Health. Doomsayer: A very useful card to slow down decks that rely on early game aggression to get ahead. Prince Taldaram: Allows you to make another Carnivorous Cube or copy something else you desperately need. Some decks run Prince Keleseth instead or a Devilsaur Egg, but this seems like the better choice. Spiritsinger Umbra: Again, it’s another card that works so well when paired with Carnivorous Cube to trigger its effect early and generate even more minions on your side of the board. Carnivorous Cube: The clue to this card’s importance is in the name of the deck – without it you wouldn’t be able to create multiple copies of Voidlord or Doomguard and there would be no archetype to play at all. Skull of the Man'ari: With just four powerful demons in the deck you’re always going to get something worthwhile when this effect triggers. Important but not vital if you don’t have the dust to spare. Possessed Lackey: This devilish creature provides a similar function to Skull of the Man’ari, but handily is only a Rare minion. Offers excellent synergy with Dark Pact and Spiritsinger Umbra. Lord Godfrey: It’s a bigger Defile that also leaves a 4/4 minion on the board. That’s quite good. You can call it a win-more card really, as Cubelock functioned well enough without it before. Continuing to run a Faceless Manipulator instead is fine if you want to save some dust. Voidlord: At nine Mana this is expensive to play by itself, but with the demon recruit options in the deck you should rarely, if ever, pay for the full cost of this sticky character. Bloodreaver Gul'dan: Now that N’Zoth, the Corruptor has gone into Wild with the latest cycle, this card becomes all the more important for refilling the board in the late game. It has no obvious replacement. Doomguard: by using the demon recruit effects in the deck you can get around the negative Battlecry that forces you to discard two cards. Useful for both clearing minions or rushing down your opponent.